Very recently I encountered a production issue and to assist me in the root cause analysis I needed information/clues that are not exposed by any SSAS interfaces so I created the metadata sniffer. 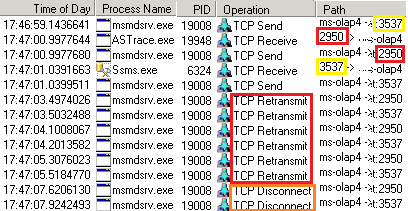 Today i was reviewing some traces and saw 2 commands i had never noticed before which had been issued by SSMS, these are shown below. The commands can be executed in a MDX query session. 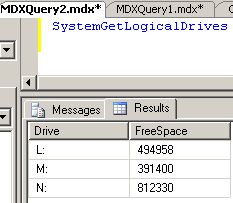 SystemGetLogicalDrives returns the free space in MB for the disk drives that are contained within the server property “AllowedBrowsingFolders”, see below for an example. I have checked and the commands work in all versions of SSAS back to 2005 and anyone can run them. Personally i think this is really useful and here a few reasons why. Cut sysadmins out of the loop when maintaining space (this is a good thing ). You might use it when collecting space stats or alerting. SystemGetAllowedFolders gives you the directories configured in “AllowedBrowsingFolders”. I hope you find this useful! I passed the info onto one of the Dev teams i work with and they certainly will make good use of it.